Bob and I have become members of the Columbus team for TasteCasting. How exciting! No? You’ve never heard of TasteCasting? You’re kidding! Well let me help you out here! What happens is that a restaurant arranges to have a tasting and a specified number of tastecasters attend and then use Twitter, Facebook, u-tube, blogging, etc to let everyone they reach know about the experience. Social networking at its best! Tonight was our first event. 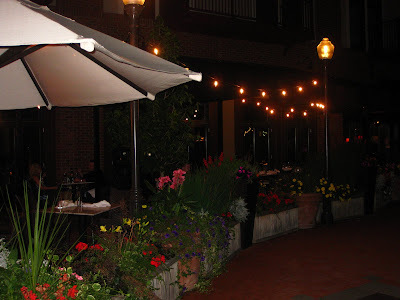 We joined other team members at Mezzo Italian Kitchen at Creekside in Gahanna. We were so excited because even though we live in Gahanna, we have yet to go to Mezzo. We keep talking about it but just have never gotten around to it. So we were totally jazzed about this! We were led to an area where there were three booths reserved for the TasteCasting team. We met our fellow team members and talked with Dan Harris, who is the brains behind the TasteCasting “revolation”. This is all his idea, and it has spread like wildfire! There are now TasteCasting teams in 18 cities! Amazing how this is growing. First let me talk about Mezzo. They have two outdoor patios. The smaller area is kind of a bar/small bites setting. There are bistro tables and you can order drinks and maybe pizza or appetizers. The other patio is larger, seating up to 72. There is a lovely fireplace and seating where you can relax with drinks and a bite to eat, or you can sit and have a full meal. It is absolutely lovely at this time of year. So back inside we all grabbed our seats. Jon Cohen (General Manager) greeted us and offered us a glass of wine. He offered “Trivento Torrontes”, an Argentine white that is light with a lot of citrus flavor. The red he offered was Cosentino’s “The Cab”. It was a smokey, medium bodied delicious wine. I am not a huge fan of red wines, but surprisingly I liked this one quite a bit. Both paired beautifully with our food. And the food! O.M.G. Can I just tell you that the entire tasting menu rocked? It did! Not a bad dish among them. I really was a happy girl! 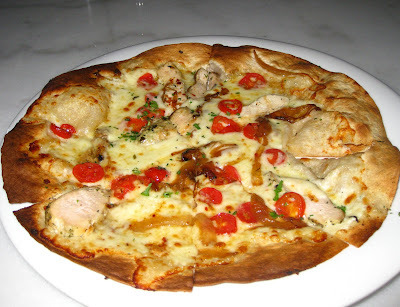 We began with the Pizzetta Flatbread. The flatbread is made on lavash; a thin, crackerlike bread. It had a roasted garlic and mascarpone spread, with slices of rosemary chicken, cherry tomatoes, and caramelized onions topped with mozzarella cheese. It was delicious! The caramelized onions were done just right and the roasted garlic mascarpone spread was out of this world! Next up was the Arancini…"I’m a not a kiddin’ ya, my knees were weak!!!" I am a complete and total fool for arancini. Oh lord, if they are made correctly these can simply make a grown woman whimper. And whimper I did. I am so not going to tell you how many I ate because there is no reason any of you need to know my business…okay? Just let it go at the fact that I out-ate anyone at our table when it came to the arancini. 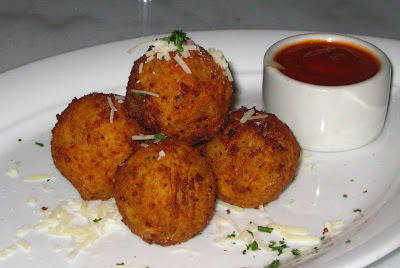 Arancini are balls of risotto that have a cube of mozzarella tucked inside and are generally rolled in panko and then fried and served with pomodoro sauce. (Pomodoro sauce is like marinara but is thicker and smoother.) There was absolutely nothing to not like about this dish!!! We then moved into the entrées. First out was the lasagna. What a beautiful plate! A generous serving of homemade noodles with Bolognese sauce, seasoned ricotta cheese and marinara sauce. The plate was finished with a swirl of balsamic glaze. Boy did this add interest! 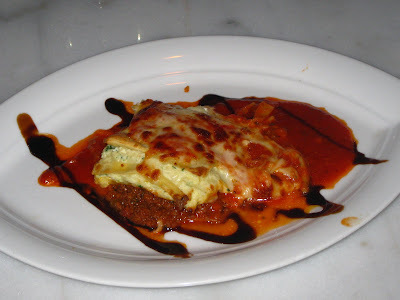 It turned a very good slice of lasagna into something quite spectacular! I just about licked the plate. And Jon poured the red cab with this dish and what a match made in heaven! This was just too good! Well, okay. Maybe not too good that I didn’t manage to finish every single last bite and drop of sauce. He also brought us a basket of rolls and flatbread that were just delicious. The flatbread was so good…and then add the butter which had bits of caramelized onions in it and you were on a whole different level. Wow! But wait! There’s more! (Okay, I know. Bad impression. But I just couldn’t help myself!) The second dish was the most popular entrée the restaurant serves. 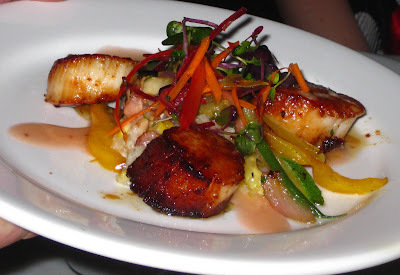 Pan seared sea scallops with sweet corn and bacon risotto with sautéed vegetables and champagne vinaigrette. Sweet baby Jesus. I cannot even do justice to this dish. To say that the scallops were perfection and the risotto was to-die-for and the vegetables were really, really good (see, I’m not much of a vegetable gal) would be one of the biggest understatements I think I’ve made all year. This dish, simply put…ROCKED! Had we not all been riding the edge of a food coma at this point I think we would have made a spectacle of ourselves. Every single one of us at the table was in awe. Then, and you are not even going to believe I am saying this, they brought us dessert. Oh yeah. Sheer decadence. 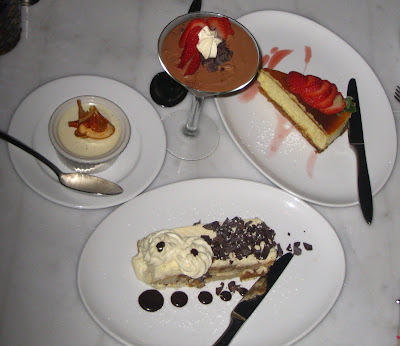 Out came a piece of cheesecake with fresh strawberries on top, a piece of tiramisu with chocolate shavings and mascarpone stars, a citrus panacotta with candied orange peel, and a rum chocolate mousse martini. Absolutely crazy. But darned if the four of us didn’t divide each and every one and eat each and every bite. Yes, they were that good. Our first time at Mezzo will most definitely not be our last. In fact, I think one of those tables right by that fireplace on the patio on a cool end-of-summer evening have our name written all over it!